Asheville Elks Lodge #608 (now known as the Asheville Hotel Building) opened their new home on June 14, 1915, (Flag Day) with great fanfare and attention. Located at the corner of Haywood and Walnut streets and designed by Smith and Carrier Architects, the building was one of the most modern Elks lodge in the southern states. The building, four stories high plus a basement level, was constructed entirely of stone, steel and brick. Wood could be found only in the windows as even the floors were made of concrete. A balcony on the second floor extending over the Haywood Street sidewalk is a well-admired architectural feature of the building. Inside the building, "no expense was spared to make it modern in every detail." The building included two elevators; one for passengers and one for freight. The task-specific rooms included: retiring rooms, club rooms, office of secretary, visitor's room, porter's room, janitor's room, private dining room, kitchen and kitchenette, main dining room, pool room, card room, reading room, conference room and a lodge room with a stage. In addition, there were 19 bedrooms with communal bathrooms at the end of each hall on the third and fourth floors for visiting lodge members. A dumb waiter serviced all floors including the roof top garden and an early 20th-century phone system connected all rooms of the building. The building underwent several incarnations through the end of the 20th century. In 1931, the building was remodeled and renamed the Asheville Hotel and was highly regarded for its attractive lobby with handsome finishes. 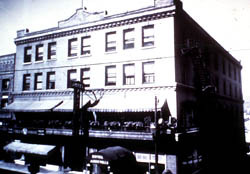 In 1957, the building was converted into a downtown department store. In the mid-1990s, the building was renovated again to house retail establishments on the Haywood Street level and a restaurant on the Walnut Street level. The upper floors were converted into private condominiums. 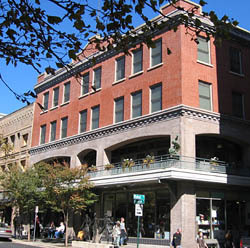 The Asheville Hotel Building is located on the corner of Haywood and Walnut sts. and is part of the Downtown Asheville Historic District . The individual businesses located in the building are open during normal business hours. One of the businesses, Malaprop's Bookstore/Caf�, has a website.